Robyn's voice was just right for the Gateshead College Induction Video. Here's a behind the scenes look; she is in the booth. Thank you Ami. Thank you Gateshead College. 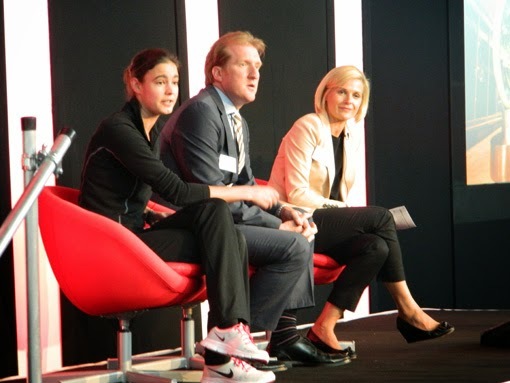 Thank you to Ami from Ami's Fitness in Jesmond for agreeing to talk about her business at the Gateshead College Student Induction events, 2013. It's nice; bringing clients together. The onebestway offices have been redecorated. They're nicer now for our clients, and our people. 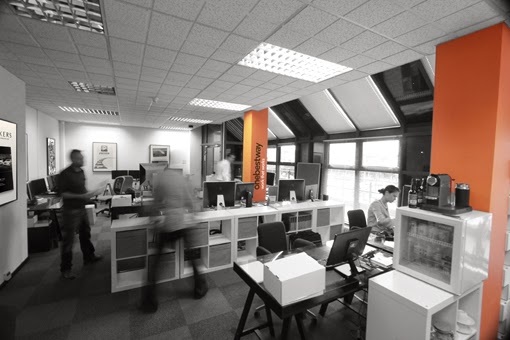 As you can see half of the office is in orange, the other half is mono. This is the final page of a four part feature on onebestway. This page is so important in our world that it's not only on our blog, but it's on our website too. Another 3 minute read; here it is. There's a zoom function at the top of the page if you need it. Mark is Technical Director at onebestway. Slightly scary and very demanding, Mark's fight for 'the next thing' in web design and software development is never ending. This 3 minute read explores how to lead a team of people to stay ahead, but to stay relevant and 'work' at the same time. onebestway's work simply has to sell more client product. 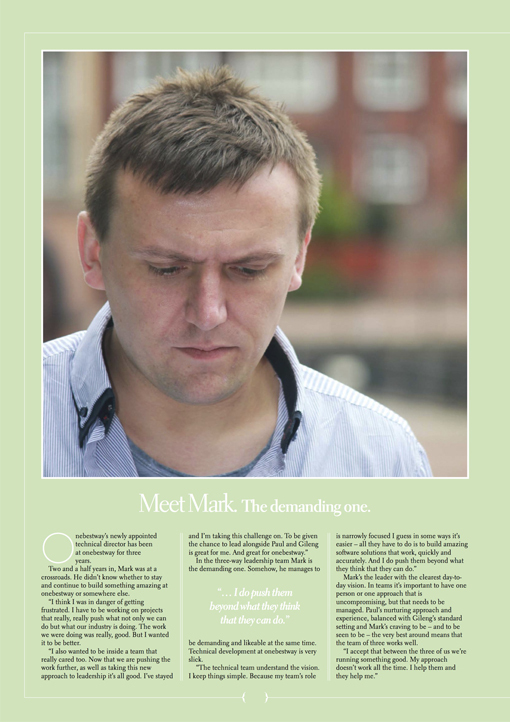 Please click here to meet Mark. There's a 'zoom' function at the top of the page if you need it. 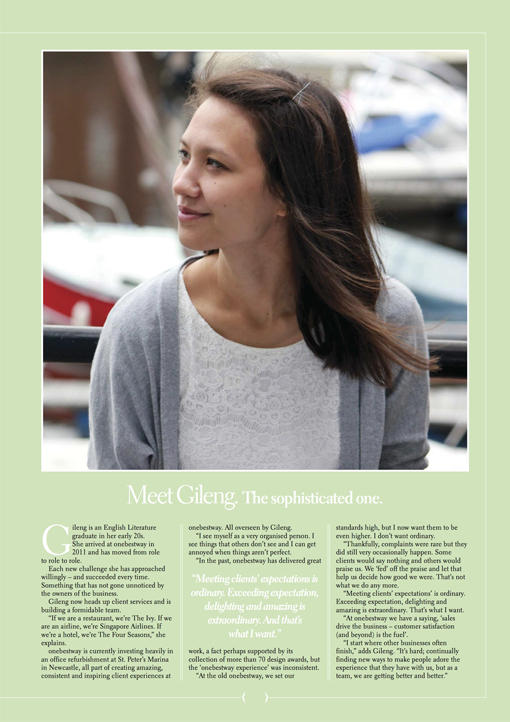 Gileng is Head of Client Services at onebestway and works hard to creating great client experiences. This 3 minute read explores standard setting at the front end of a business. It's hard to be consistent in this area and maybe some of the things we're learning will resonate with you too? Please click here to meet Gileng. 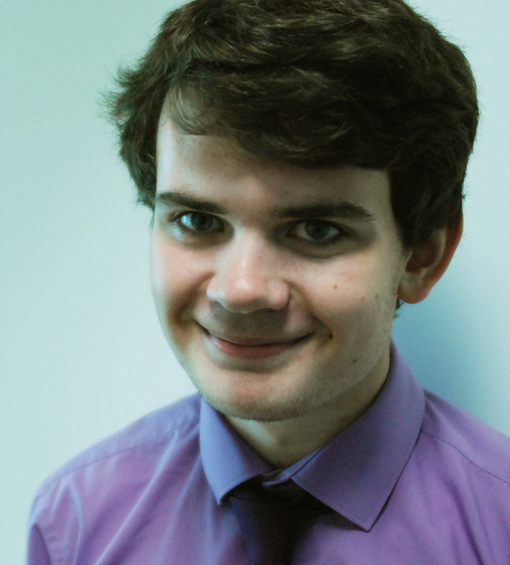 Jack has joined Gileng's team in Client Services at onebestway. We chose Jack from an initial pool of about 30 Apprentices from Rob and Charlotte's great young people over at the National Youth Film Academy. He starts on Monday next week. Paul's job at onebestway is hard. He runs the business in the day-to-day, supports the section heads in their roles and is responsible for delivering the board's longer term vision too. Maybe, in this 3 minute read, you can relate to some of the things that Paul has to contend with - in your business? 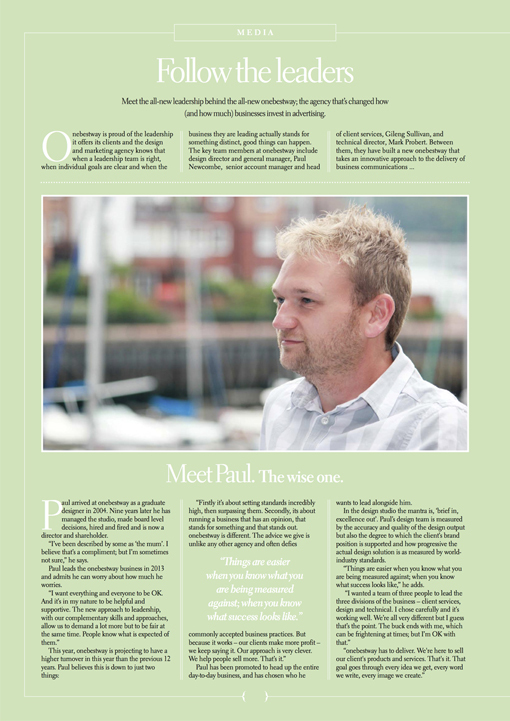 Please click here to meet Paul. There's 'zoom' function at the top of the page if you need it. It's nice to see your work out and about. 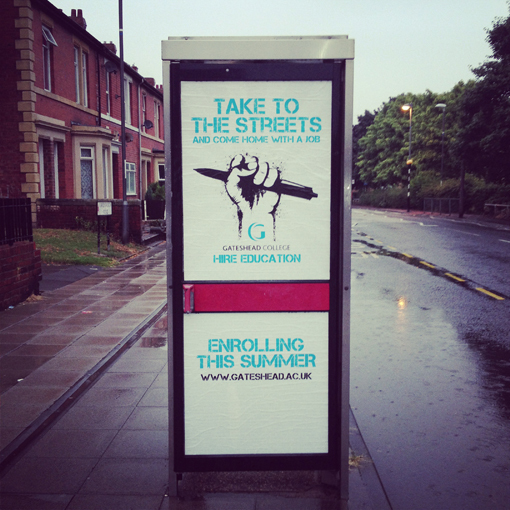 And none is more satisfying at the moment than onebestway's Gateshead College work. 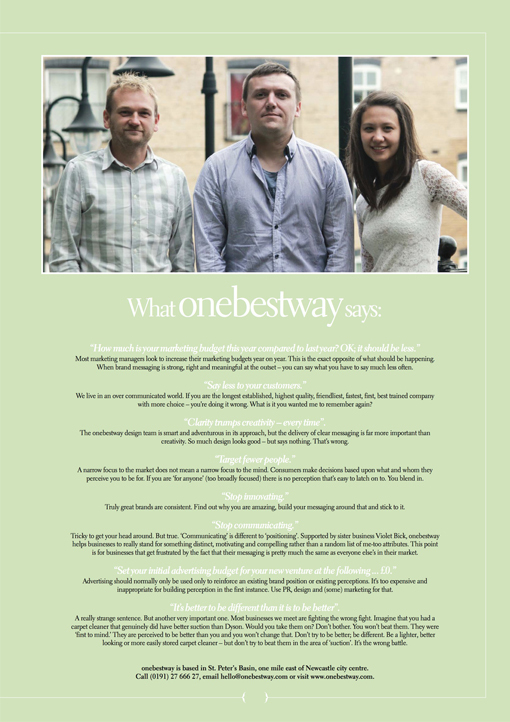 It'll be profiled more fully at the new onebestway website - to be launched later this month. onebestway is entering its 14th year and is growing a little. I'm looking to add fresh talent to our onebestway design team. You will have a real flair for online design (websites) and/or you will have a real flair for design for print media. If you consider yourself to be exceptional at both then that's good. But I am OK seeing you whatever you consider your specialist area to be. Senior Design Professionals. Yes - I'm interested in meeting you please. Probably just for a chat initially to see if your ambition matches ours. There is room for one or two of you here at onebestway based on the current workload and pipeline. But pop in and absorb who and what we are first. Let's see if we match. It is likely that you will be in employment now, so we'll be very discrete. Middleweight designers. Yes, you too please. You will be ambitious and talented. If you feel like you are in a rut where you are today, please get in touch. There is lots of room for growth here. onebestway pays pretty well and gives everyone in the team the power and opportunity to grow as designers and as significant team members. We're keen to continually improve and are hungry for increasing success. So it's a good place to be. All the fundamentals (long hours, consistency, accuracy, love of your work, a passion for our brand, being a great person, looking after and being there for the people around you, being 'can-do' and positive, being an excuse-free winner). The ability to produce progressive design. I don't really want you or us to be doing what we or I have seen before. What's our industry, world-wide, actually doing to push and push and push? I expect you to see every single job (without exception) as an opportunity to do something incredible. You must have - and be able to articulate compellingly to both your colleagues and clients - great ideas that make sense in the context of everything on this list (above and below). Your execution of the concept will be exceptional, every time. All of your work will work in the context of a wider tactical approach to a business' marketing communications. You must understand the implications of this. All of your work will work in the context of a wider strategic approach to a business' marketing communications. You must understand the implications of this. You will understand the basic principles of brand. Your design concepts, ideas and execution will be brand supportive. They will help to support, strengthen and underpin the business' brand position. Your work will work. onebestway produces work that works - only. It must 'do' something for the business, and in the context of everything on this list. If it just 'looks good', that's no good. The things towards the top of this bulleted list I expect you to have now. The things towards the bottom you will learn within days and weeks if you do not have them already. Please send an impressive and stand-out email to mike@onebestway.com. A current cv and a link to a really well considered portfolio is important too so please include them as well. The portfolio can be a website or a great PDF presentation. And if anything in any part of what you send to us is spelled incorrectly, we won't take your application any further. Sorry. Thank you for considering approaching onebestway. 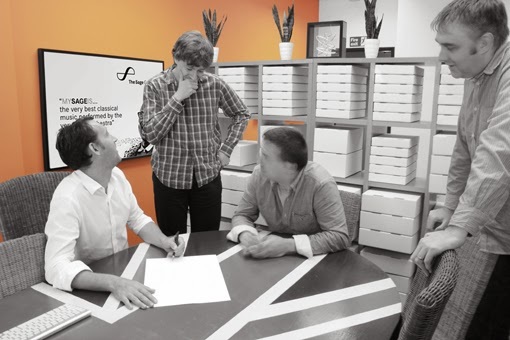 We are one of the North East's longest established professional design and marketing teams and our ambition for the future is more sharply defined and honed than it has ever been. 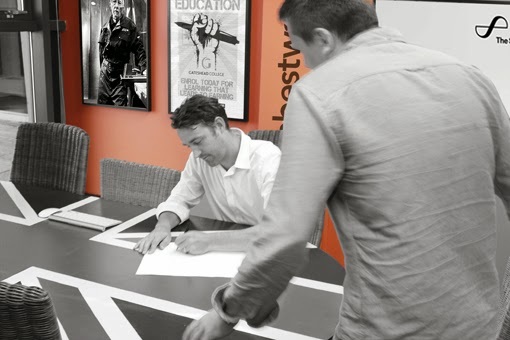 We seek only genuinely talented, committed and ambitious people. Strictly no agencies at all at this stage please, unless we contact you. Clients include sector and UK market leaders including Gateshead College, Pennine Windows, Sage Gateshead, BALTIC, Letslivehere, Violet Bick, Activities Abroad, Robert McAlpine, Baskeys, Mintprice.com, Newcastle College, Northumberland College, Derwentside College, TyneMet College, Sarah Hall Consulting, Newcastle Diocese, Durham Diocese, Onyx, Stadium Group, Akzo Nobel, Age UK, entrust, Project North East, angelfysh, University of Moscow, University of Sunderland, TLW Solicitors, Emmaus, The Customs House, Turney Wylde, Balfour Beatty and Royal Mail.